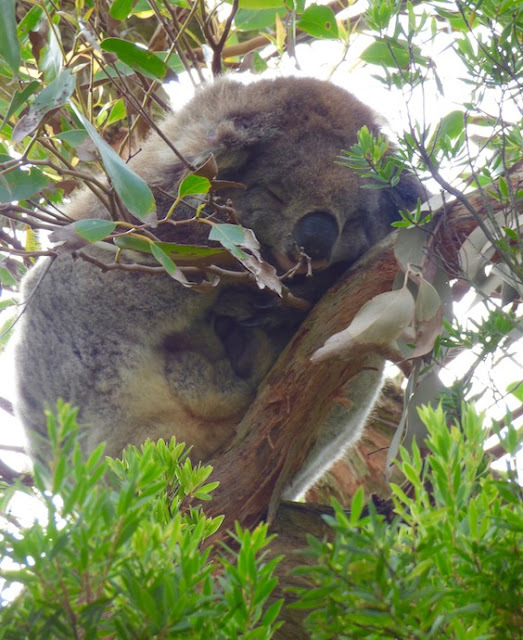 Galley Wench Tales: Oz: “Drop Bears”-- Fact or Fiction? Koala - in the wild! Otway National Park on the way to Cape Otway lighthouse. Off Great Ocean Road Victoria Australia. “Watch out for the drop bears,” warned Ozzies, with a wry smile. 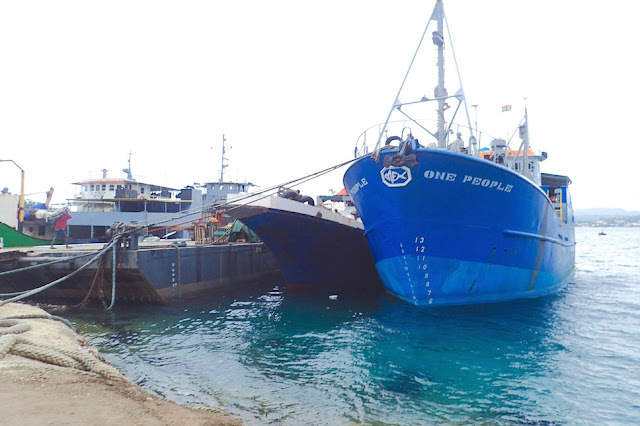 Given the Ozzie penchant for leg pulling, I assumed they were joking, like Peter Meyer did on Fraser Island, with his toy koala wearing a backpack. Besides, in my Australian travels, I’d never seen a live koala anywhere besides in a zoo, despite several trips to Australia before, which included a fair bit of wandering about in the bush. Much like spotting bison in Yellowstone, and grizzly bears in Glacier National Park, the telltale sign was not my brilliant spotting ability, but the intelligence of crowds. We stopped to see what the cars in front of us stopped to see. And there it was! Our first sighting of a koala in the wild of not just one but two koalas — about 25 feet up in the gum (eucalyptus) trees, each on a different tree. More amazingly, as the cute critters typically sleep up to 22 hours a day, one leapt horizontally, about 10 feet, from one branch to another! He (or she – hard to tell from my vantage point), then promptly tucked in and fell fast asleep. Bare manna gum trees. Otway National Park on the way to Cape Otway lighthouse. Off Great Ocean Road Victoria Australia. 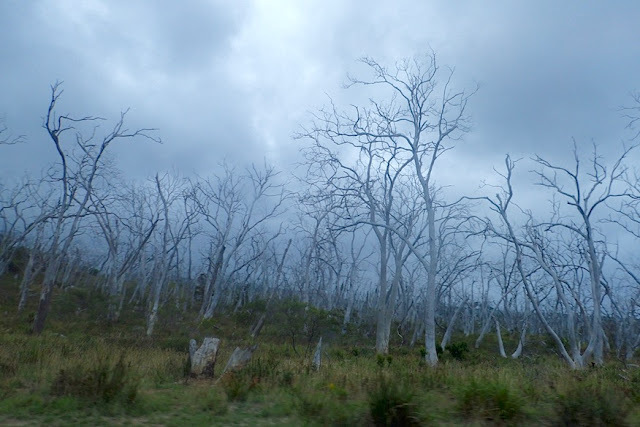 A bit closer to Cape Otway lighthouse we noticed a ghostly stand of trees, weather-bleached gray leafless silhouettes. 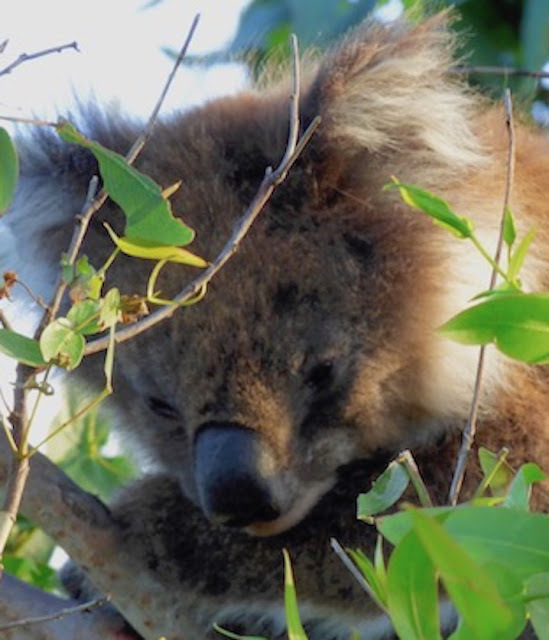 Were they stripped bare by voracious koalas (no - they only eat about a pound and a half of gum tree leaves a day). Insects? Wind? Disease? Ranchers? In fact, as we later discovered*, the full story on these trees plight is still considered a bit of mystery. Conservation Ecology Centre Cape Otway info poster about bare manna gums. Great Ocean Road, Victoria Australia. Leaving the lovely Cape Otway lighthouse in search of a campsite for the night, we rounded a turn and encountered stopped traffic both in front and facing us. 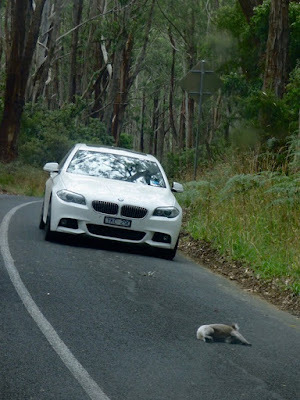 In between in the center of the road, a koala lay on its side, feet and belly pointed our way, its upper ear twitching. Cautious when it comes to handling wildlife, I puzzled momentarily over what to do. In the past, I’ve used towels to protect my hands when moving a wayward bird or an upset kitty. 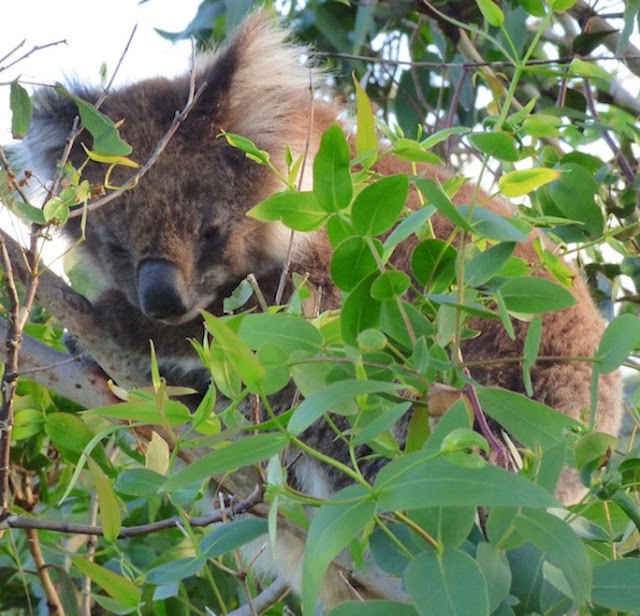 Whilst I racked my brain on our towel’s location, the docent we met earlier at Cape Otway lighthouse pulled up behind us, exited her car, grabbed the koala with her bare hands and relocated on a tree. “It’ll be ok,” she assured us. Whew! A few kilometers later, once again parked cars flanked by standing tourists alerted us to another koala. This little Ozzie sleeping tree bear was a mere 10 feet up a tree. Our final koala sighting of the day was pointed out to us by some fellow campers later that eve at Aire East Campground. The small, sleepy koala was nearly close enough to touch. Yes, “drop bears” are indeed real. Fortunately for both us and the drop bear, the condition wasn’t fatal. 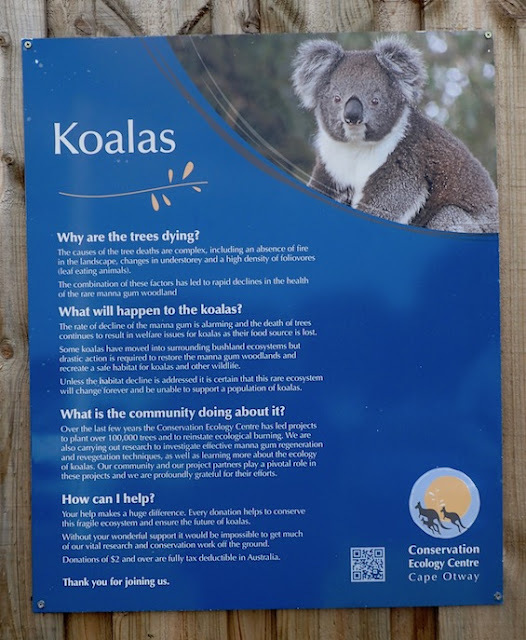 If you’d like to learn more about koalas and the efforts to better understand and protect their environment, check out the Conservation Ecology Centre Cape Otway website. 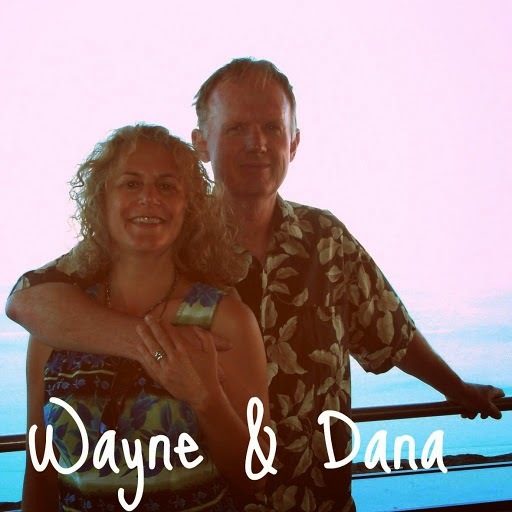 Consider supporting their efforts with a donation. And if you’re in Australia, watch out for the drop bears – seriously – but be far more careful of the kangaroos. ‘Roos are a lot more prevalent, bigger and more likely to cause damage. Koala in the Aire East Otway National Park campground. Victoria, Australia. 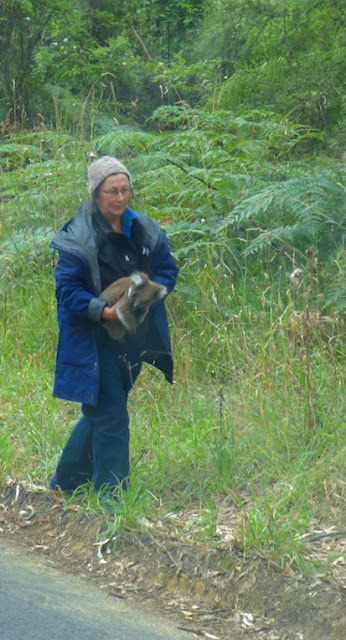 This post covers a few of the events on February 25, 2017 in Great Otway National Park, off Victoria’s Great Ocean Road, Australia. This was posted when we returned to wifi, when we arrived at our current location, Hahndorf, in the Adelaide area of South Australia. Still lots of catch up posts. Meanwhile, we’re taking a clockwise tour of Australia over land, in a new-to-us 4-wheel drive. In particular, we’re looking forward to spending time in the wilder portions of Australia’s Western and Northern territories. Closer view; koala in the Aire East Otway National Park campground.